The pot roast recipe is excellent. I have made it twice and I've never made pot roast before. It is brined overnight in buttermilk - I marinated it for three nights- and it was fall-apart tender. My boss and my roommate who were both raised on pot roast loved it, but didnt know about the buttermilk method. Also great suggestions for how to use up raw cream. The whey recipes are great- esp for anyone looking for how to use raw milk up. I think this is her strength. However I am not a big fan of her nontraditional methods, which she applies to all non-European recipes. If you can't be be bothered in presenting authentic recipes representing ancient traditions easily found in immigrant homes across America, then don't attempt it or it damages credibility of the traditional food cause. What I'd like to see more of from Sally Fallon is what she does well--locate traditional European recipes. How about a French recipe for cooking potatoes in duck fat, rendering fat from beef bones and storing it, a good Polish cabbage roll, and a Norweigan recipe for how to use smoked kippers, and Southern recipe for tinned salmon croquettes. The cause needs an author who has the connections to find those recipes from immigrant chefs who remember these traditions firsthand. They are all over the US. So dont forget to include the authentic Indian coconut chutney, actual Chinese beef tendon soup or chicken bone broth soups, honest to goodness Jewish chicken foot soup, real Japanese tallow fried Okinawan entrees, Filipino chicken adobo, authentic Korean short ribs and sol lung tang marrow soup, and the genuine Mexican beef shank soup like caldo de res, menudo and other fine recipes before presenting them. Any West Price fans out there in New York, Boston, Los Angeles, Houston, Atlanta, San Francisco or Portland who want to write the missing volume? Come on! My seven word title is the gist of this book, although I could have added, "and stuff derived from animals". Obviously I'm a fan of Michael Pollan's "In Defense Of Food". While "Nourishing Traditions" may appeal to a segment of the North America population who long for the good ole days, it's out of step with what's been learned about the healing benefits of plant-based nutrition, and in particular, cruciferous vegetables. Before you buy into the "It's all the fault of processed foods" theory, read Michael Pollan's The Omnivore's Dilemma: A Natural History of Four Meals, and then his In Defense of Food: An Eater's Manifesto. After that, if you're still longing for raw cows milk, read Colin Campbell's The China Study: The Most Comprehensive Study of Nutrition Ever Conducted and the Startling Implications for Diet, Weight Loss and Long-term Health. To say Nourishing Traditions is politically incorrect is a gross understatement. It's incorrect in many other ways as well. Six or seven years ago a friend of mine underwent bypass surgery, when he was in his mid-sixties. Shortly after that he stumbled on to the Weston A. Price Foundation, where he met Mary & Sally. They told him what he wanted to hear. His heart disease was all the fault of processed foods. High-fat animal foods are heart healthy! Cholesterol is a nutrient! Not too long after that he took up running, and I first met him at a pub run. I also had become quite interested in nutrition, especially after reading John Robbins' The Food Revolution: How Your Diet Can Help Save Your Life and Our World. Needless to say, while we were both in agreement on the dangers of processed foods, we had near polar-opposite views on animal-based foods. We passed information back and forth for a while, but neither one swayed the other. Finally we just agreed to disagree. About two and a half years ago, while running alone on an intown trail in some pretty cold weather, my friend passed out for a good chunk of time. As it turned out, from lack of blood-flow to his brain. A few months later he told the surgeon who restored greater blood-flow through his most severely blocked carotid artery that he now intended to adopt a plant-based diet. He was quite surprised by his doctor's response. "If it were me, that's what I'd do". He later told me, "So they know!" This book has changed my life. I was just 2 months pregnant with my fifth child and feeling like my body was being subtracted, for lack of a better term, to build the child. I had always had feelings like this while pregnant, but this time it was unbearable. I knew I needed some powerful nutrition! At the same time, my 7-year-old son was told by the dentist to get multiple fillings for multiple minor cavities, and to increase his fluoride exposure. (We had already been using fluoride-free toothpaste). I told the dentist that I saw fluorosis on his teeth and that since he was symptomatic of fluoride overdose (as the fluorosis showed), I could not give him yet more fluoride! She did not argue with me. I won't be going back there. So I did some research and found that this book purported to have the dietary answer to tooth decay, being based on the work of Weston A. Price. I was delighted to discover a wealth of wisdom and information; I switched us to the NT diet. We'll never be the same! Within one week I felt so much better and have only continued to improve. My children now *refuse* to eat sugar (YES, IT'S TRUE! ), and damaged places on my teeth are growing back. My sons faces have begun to widen, and best of all, my baby was born with a beautifully spacious set of dental arches! Oh, and my formerly chronically ill husband is no longer sick and has put on much-needed weight, along with energy, mental clarity, and a cheerful disposition! If I were to keep one of my cookbooks, THIS would be it. The recipes are wonderful and delicious, not to mention healthy and traditional. My kids are thriving following Ms. Fallon's recommendations on dairy, fermentation and grains. At first, when I got this book, I was intimidated by the fact that many of the recipes use whey, which you probably need to produce yourself. The first recipe that looked doable was the sourdough bread. I liked the fact that there's only flour, salt and water in it, and that it has one long rising time, and keeping a running pot of sourdough starter for the next batch. Recently though, I produced some whey, and we used it for millet, beet kvass and porridge. I feel good about the way we're eating because of this book. This cookbook has faults, some of which have been accurately described by reviewers here, and certainly a busy single person like me cannot spend the hours in the kitchen which it would take to derive all his nutrition from these recipes. However simply by using this book once in a while I have improved not only my enjoyment of cooking and eating but also my health. After pancakes and muffins that are made by soaking the flour in yogurt first, after soups made from these broths, after make real fermented foods a part of one's diet, one will find it very hard to go back to eating any other way. Not only this, but for me this book was the beginning of serious thinking about how we live and how nature and culture can work together--with food only the starting point. The biggest problem for me was the amount of advanced planning this book requires. It is not fun to start a dish and then realise that something needs to be soaked twnty-four hours before being used. But once one gets accustomed to advanced planning--simply deciding the night before what one wants the next day and taking the requisite steps--it becomes easy and natural and in the end saves energy as, when one begins to cook, much of the work has already been done. Reclaim your health one meal at a time. Nourishing Traditions provides recipes and reasons, not only for personal health but for the health of the planet. Far more than just a cookbook, Nourishing Traditions is life changing. I believed I was nutritionally aware, until this book. Traditional foods, traditional methods. Reclaim the health for yourself and your family, one meal at a time. NOURISHING TRADITIONS is the Nutrition Bible for the world. This book explains the diet of peoples around the world who never had disease. Current research is now proving the importance of the right type of fats in balance. Plastic fats made from processed vegetable oils are causing many disease and ill health. Saturated fats are not the villains. Raw cows milk from pasture fed animals, organic eggs from free range chickens may not give a variety in the diet but you do get better health! Read this book, try the recipes and be healthy! I have studied with Sally Fallon whose book is based on the research of Dr Weston A Price who lived with 14 groups of people around the world for 10 years at the end of the 1030s and into the 1940s. Become enlightened and become healthy. Lose weight and rebuild your immune system. This is a book I picked up at my in-laws one weekend and ended up ordering it on Amazon that night. Once I started reading it I couldn't put it down. This is a life changing book, not just a cookbook or your average nutrition book. I thought I was pretty informed about nutrition until I read this and I am learning so much on how food is processed and how this affects my health as well as much much more. This is all backed up with research and references. Everyone should own a copy of this book and I will be buying it for everyone I know. *	Eating whole foods including dairy. Animal foods should come from pasture-raised animals and fish from deep-sea waters and dairy should be raw. *	Use of preparation methods of our ancestors for optimal nutrient absorption, for optimal digestion and to make foods delicious. This includes soaking of beans, nuts and grains in acidic water (homemade whey water, water with added balsamic vinegar or umebushi vinegar), sprouting of grains, making use of chicken, beef and fish stocks and broths. *	Natural fermentation; a) of vegetables such as relishes, pickles and sauerkraut for better digestion of grains, beans and protein b) lacto fermentation - to promote helpful enzymes and antibiotic substances of dairy and to extract whey used in the pickling process mentioned above. Fallon and Enig raise the question of whether many modern viruses are the result of the fact that our intestinal flora is out of balance. Something that they claim could be prevented through intake of friendly bacteria. *	Avoidance of all processed and refined foods, animal protein with additives and preservatives, any foods with artificial flavors, colors and sweeteners. Nourishing Traditions serves as a valid reference full of advice and ideas especially on `how to' prepare and preserve our foods the traditional way, which is an art that many of us have lost. The book also has a thorough introduction to macro-nutrients (part about fats is especially informative), vitamins, minerals and enzymes. The emphasis on such high intake of animal protein and fats will likely make the reading of this book quite challenging and thought provoking for many. However, even people who eat very little or even no animal food (like myself), will find useful information on how to cook and prepare grains, nuts, seeds and vegetables for better digestibility and nutrient absorption. One of my favorite books of all time!!!!!! If you care about your own health, GET THIS BOOK! It is a valuable resource of info on not just recipes, but also there are so many exerpts from other books and journals on the subject of food and its link to health. I started eliminating sugar from my diet, and my health has improved a lot. I had been getting symptoms of Rheumatoid Arthritis, but after eliminating refined sugar and flour from my diet and drinking raw milk, the symptoms have gone! My wrist joint had been swollen and very painful, I couldn't even lift my son because it hurt so much. After kicking the sugar habit (you have to read labels, that junk is in almost every processed food), I started feeling so much better, and after a few months my joint is back to normal, the swelling went down and it has not come back, even if the weather gets cold! This is one book I recommend to all my family and friends. The only thing I had to modify were some recipes. Like with the pancake recipe, when I followed it exactly my pancakes were too runny, more like crepes. I just added a bit more flour and that solved the problem. I made the breakfast pastries, but they didn't rise and they turned into flat crumbly cookies. Other than that, the other recipes I tried were great! I also have stronger teeth, I had gotten a tooth abscess and it was infected (it was throbbing and there was a swelling under my gum). I was scared to go to the dentist, so I took 3 cloves of garlic, minced them, put them in broth and simmered them for only a minute, then ate it all. I did this for about 3 days and it stopped the infection. To get rid of the abscess you have to get a cotton ball, wet it and dip it in baking soda/salt, then put it against the abscess under your gum. That will eventually pop the abscess. I then started drinking raw milk and stopped eating sugar and my tooth is getting a lot better! It used to feel 'loose' in my mouth and I couldn't bite down on that side for the longest time. Now I am using that side of my mouth to chew and it feels stronger already. 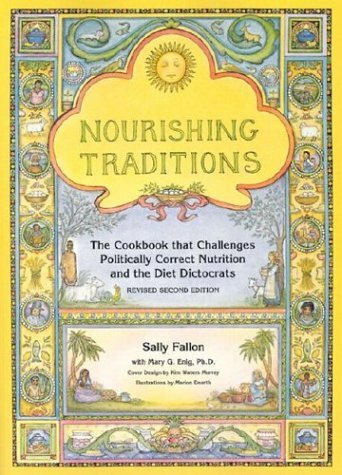 Having already assembled an extensive library of nutritional information it's an understatement to say I was pleasantly surprised and pleased at both the quality and practicality of so much long lost knowledge so well presented in Ms. Fallon's excellent book, Nourishing Traditions. Reading it transports me back to my own childhood years (the 50s) on my grandparents little farm, where nearly everything we ate was home grown - and we were never sick! Nourishing Traditions confirms in simple, concise layman's language what I always suspected, that most modern processed foods aren't fit for man or beast. It also reveals many of the little "secrets" that my grandmother's innate and old-fashioned knowledge utilized to keep all who entered her house well fed and healthy. So far I have personally purchased 10 copies (1 for each of our kids, 1 for my doctor, the rest for wedding gifts) and recommend it to anyone with a health issue who will listen to nutritional information. Anyone can read and understand it. Besides all of the above, I quickly came to consider it the most user-friendly health-related book in my library. It is now my first "go to" for health or nutritional information. Thanks to the authors and publisher for a superb and valuable piece of work and thanks to Amazon for making it available at such a reasonable price. I love the principles in this book. Great recipes too. There are especially good recipes on ethnic foods like curry and peanut sauces and sauces with coconut milk! So many little fact tidbits written to the side of each page so it's a wealth of info. There is some sound advice, but this is poorly written. The first section is hard to read due to its being packed full of facts that seem to not connect with each other. One must read very carefully to get the gist of the sections about "Carbohydrates", "Fats", et cetera. There are some interesting recipes, to be sure, but too often the ingredients are not written in the order they're used in the recipe, which is the way most recipes should be written. For example, a recipe for homemade baby formula starts out with dissolving gelatin in the water specified in the recipe...but both gelatin and recipe are about 3/4s of the way down in the ingredient list. It doesn't make for easy cooking. Not all the recipes are like this, but enough are to show inconsistency in the editing and writing process. Then, too, the section on "Desserts" seems very much like it was written by a sufferer of multiple personality syndrome...while the recipes call for various sweeteners (and even white flour, typically a taboo food in the rest of the cookbook), the sidebar sections warn of the dire consequences of eating sweet foods. If the author is so dead set against sweet foods and desserts in the name of radiant health, why include recipes for them? It is confusing. As one other commenter mentioned, circular reasoning abounds with the teaching in this cookbook. Circular reasoning ALSO abounds in the people who follow the teachings in this book. Those of us who dare to question any of the "arguments" Fallon provides are marginialized. The teachings her followers subscribe to are blogged about with great "authority" (as if they themselves were expert nutritionists), and the followers of her teachings treat those who question them with exclusivity against others who disagree with certain of her "findings" by "unpublished studies". Much of the expert advice in her book have been addressed here. There seems to be an aire of "heightened spiritual salvation by nutrition" in many of Fallon's followers. "Their god is their belly."